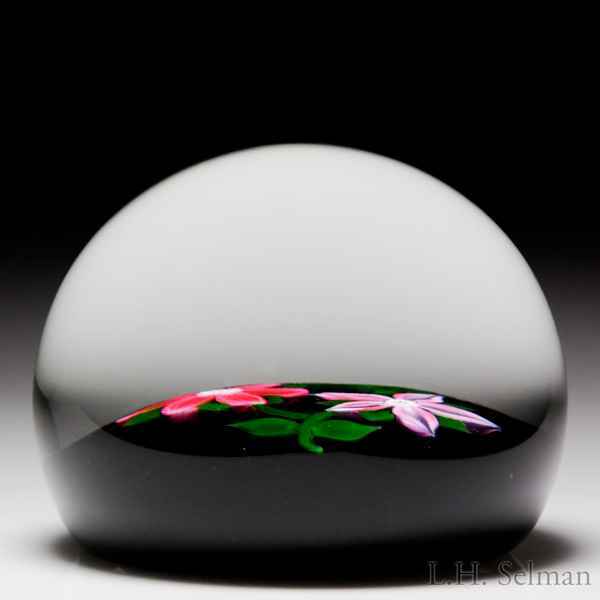 William Manson 1981 pair of pink clematis paperweight. A six-petalled pink clematis, its petals rounded at the end and variegated, blooms on a vine with an unopened green bud and leaves next to a five-petalled example, its pink petals pointed deeply and grooved, both with a similar complex cane center. Translucent dark purple ground. Edition #29 of a limited edition of 250. Signature cane. Diameter 2 15/16".